Arthroscopy is an operation on a joint which is done by a “keyhole” technique. An instrument which contains a video camera is inserted into the joint to allow examination of the inside. By using specially designed probes and instruments, the surgeon can also do some treatments to the inside of the joint. Why would it be done? Arthroscopy of the ankle is usually done after an injury which is failing to settle and where there is evidence of damage to the ligaments or surfaces of the ankle (articular cartilage), or inflammation of the lining (synovitis). It is also a good way to remove loose fragments from the inside of the ankle. Sometimes it is done to assess the severity or extent of arthritis, or to treat arthritis by fusing the joint. The ankle is first examined carefully with the leg relaxed. Special X-rays may be taken. Traction is applied to the ankle. This is done with a special strap around the foot and leg. Fluid is injected into the ankle. Cuts are then made at the front of the ankle, one at each side. Occasionally another cut is required at the back of the ankle. Each cut is about 1cm long. Through these cuts, a camera and instruments are inserted into the ankle. The whole of the inside of the ankle is examined and any necessary treatment carried out. The ankle is then washed out and the cuts sealed with adhesive tapes. Can it be done as a day case operation?? If you are medically fit, have someone who can collect you and look after you after the operation, and you are comfortable afterwards, the operation can be done on a day case basis. However, if you have other medical problems such as diabetes, asthma or high blood pressure, you may have to stay overnight after surgery. If you cannot be collected and looked after you must stay overnight to avoid complications. 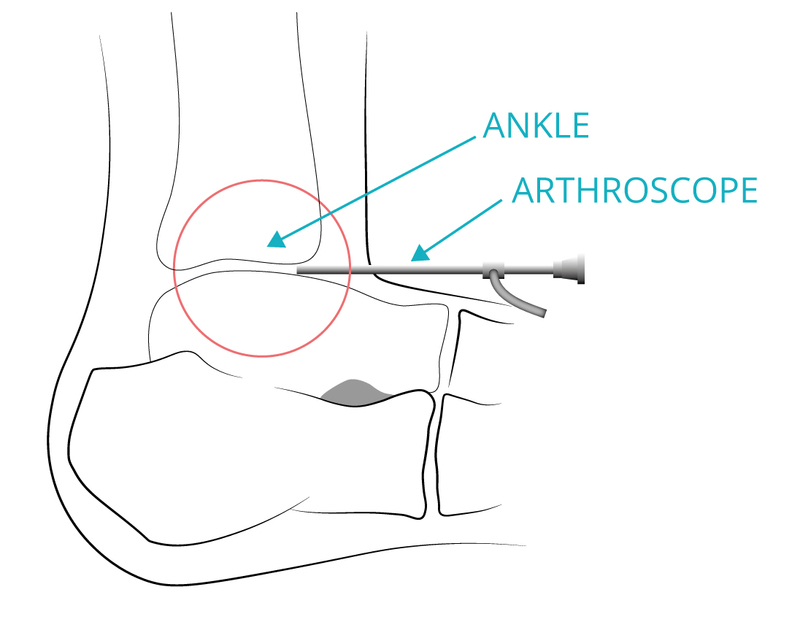 Most ankle arthroscopies are done as day case operations. If the operating list has a particularly early start you may need to come to the ward the afternoon/evening before the operation to see the anaesthetist, but you could go home for the night after being seen by them. Will I have to go to sleep (general anaesthetic)? The operation can be done under general anaesthetic (asleep). Alternatively, an injection in the back or leg can be done to make the foot numb while the patient remains awake. Local anaesthetic injections do not always work and in that case you may have to go to sleep if the operation is to be done. Your anaesthetist will advise you about the best choice of anaesthetic for you. In addition, local anaesthetic may be injected into your ankle while you are asleep to reduce the pain after the operation even if you go to sleep for the surgery. You will also be given pain-killing tablets as required. What will it be like afterwards? There will be a bulky dressing round your ankle. When you have recovered from your anaesthetic, you can get up, walking freely on your ankle. We try to discuss the findings of your operation with you before you go home, but if you have not recovered by the time the surgeon leaves the hospital, or if you are ready to go home before the surgeon is free, the ward staff will simply tell you any important message from the surgeon and the findings will be discussed in clinic. Please note that if you have had a general anaesthetic, you may not remember what is said to you and so it will all be repeated in clinic. You can remove the crepe bandage and wool padding 3-4 days after the operation, but leave the adhesive dressings, and start exercising your ankle, using both up-and-down and side-to-side movements. The ankle will still be fairly swollen, bruised and stiff at this stage, so you should keep it up when not walking or exercising. If it gets very swollen, you can put some ice on it for 10-15 minutes. You will need to see the nurse at your local G.P. surgery approximately 10 – 12 days after the arthroscopy to have the adhesive dressings and tapes removed and to check the wounds have healed. <image002.png>You will be seen in the outpatient clinic 6-8 weeks after your operation. Your ankle will be examined. The findings of your arthroscopy will be discussed with you, and any further treatment that is necessary will be arranged. Physiotherapy is sometimes prescribed at this stage, but many people do not need it and can exercise on their own. If no further treatment is required and your ankle is healing well, you may be discharged from further follow-up at this appointment, or a further check-up may be arranged. Will I have a plaster on afterwards? No plaster is required. We want you to start exercising your ankle as soon as possible. You can walk on the ankle immediately you have recovered from your anaesthetic. It may be quite sore for a few days and some people need crutches to take some of the weight off their ankle. Almost everyone can walk fully weight-bearing on the ankle within a week. If you are comfortable and your work is not too demanding, you could go back to work within a week. However, if you have a heavy manual job, or have had extensive surgery within the ankle, you may not be able to go back for a month. If you have an automatic car and are comfortable, you could drive within a couple of days of the operation. Otherwise you can drive about 1-2 weeks after surgery, depending mainly on your comfort. As you recover from your operation, you can gradually increase your activity, determined by comfort and the amount of swelling and flexibility in the ankle. Start with walking and cycling, then light running. Make sure your foot and ankle are fairly flexible before moving to twisting or impact activities, and make sure you can turn and jump comfortably before returning to contact sports.